that you can share over the web, IM, or eMail. 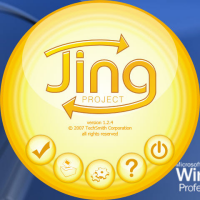 Jing Project is a handy tool to create tutorials from your desktop. My friend Denny has created a short video to tell you more about it. I recommend that you add it to your selling toolbox. Take about 90 seconds to watch it. Then think of the many ways you can use this free utility to increase your selling ability. If a picture is worth a thousand words, a video is probably worth a million words. Imagery helps your audience formulate decisions. Use the right images at the right time and you may be able to close more sales. Don’t just write it, show it. This entry was posted in Consulting, Internet Marketing, Marketing and Advertising, Selling and tagged Marketing, Selling. Bookmark the permalink.